The result was not unexpected. It was always going to be a big ask for Leicester City to beat Chelsea away from home and this result was, therefore, completely expected. The scoreline does not tell the whole story, however, with the Foxes having a fair proportion of attempts on goal and playing attractive football en-route to their defeat. This was Leicester City at their best, playing good football and taking the game to their illustrious hosts. It could have been very different. On another day, the ball might not have fallen quite so nicely for Chelsea and Leicester might have had a lucky break or two. A goal before half time and Chelsea might have been on the back foot, certainly going into the second half just one goal behind would have been a major fillip to Nigel Pearson's side. But it was not to be and Chelsea's class shone through. They were the better team and deserve their semi-final tie. Foxes' midfielder Neil Danns was the brightest spark in the Leicester City team this afternoon and it was through his efforts that the away side were able to cause problems for Chelsea. His determination and work ethic shone through; when Leicester were at their best at Stamford Bridge it was largely due to the efforts of Danns in the heart of the Foxes' midfield. His cameo in the last ten minutes served up something exquisite as he curled-home a sumptuous strike from 35 yards plus. A truly wonderful goal. Against a classy Chelsea side, Jermaine Beckford led by example from the front. Thirsty for the ball and showing a full commitment to the cause, the Foxes' striker created chances and was not afraid to have a shot at goal himself. His perseverance was rewarded when he followed-up Dann's rifling shot, beating Pensioners' keeper Peter Cech but not the post, to slot home his twelfth goal of the season. Noisy, colourful and well-behaved, the Foxes' fans were on superb form at Stamford Bridge. They out-sang the Pensioners' prawn sandwich brigade and provided plenty of spectacle for the TV cameras. If that form can be transferred to the library that is the King Power Stadium, perhaps finally the decade-long move into City's new home will finally be complete. This was an untypically off-form display from City's Danish goalkeeper. 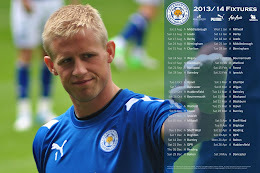 Kasper Schmeichel failed to deal with two crosses and came out second-best twice in one-on-one situations. It is rare that Schmeichel suffers criticism but, on this day, he might take blame for the scoreline erring towards the embarrassing. The Scot was ineffective following his return to injury but what will frustrate Paul Gallagher more is that he was not given a full game to return to form. His knee gave way having got stuck in the Stamford Bridge pitch and, despite playing through the pain for ten minutes or so, he was rightly withdrawn before half time. An off-colour display from the Irishman, who struggled to match Chelsea's Juan Mata and Soloman Kalou for class on the wing.